Do you know anyone that enjoys germs? I certainly don't, so when I got the chance to try out a new product to help me avoid touching the toilet seat, of course I jumped right on that one! This is a big issue because we are potty training, so I want to incorporate a fun part of the toilet, and avoid all the nasty germs boys have. haha! So, I want to introduce you to The Shandle. Our story begins with friendship, ice-cold pilsner, and the graffiti covered bathrooms of the Big Apple. We met as young product designers in New York, and were known to frequent the various downtown watering holes that make the city so special. But after rushing out of one too many nasty bathrooms, an idea struck: create a product that would make touching the toilet seat a thing of the past. Six weeks later, we launched theshandle.com and began selling our unique toilet seat handle to the world. 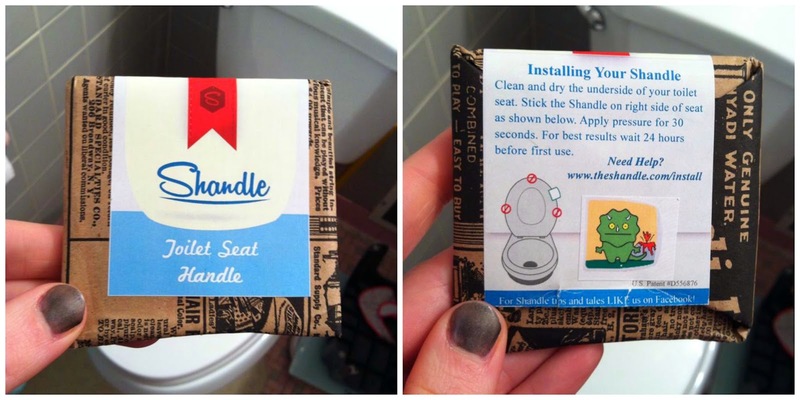 Fast forward to present day: we now run our own product development company, we are both new parents with potty training on the horizon, and the Shandle has evolved to be more useful than we ever imagined. Our little bathroom hack can be found in suburban houses, city apartments, children’s bathrooms, college dorms and nursing homes. No matter where it's used, the Shandle endures as a simple idea that makes the bathroom just a little better for everyone. We know you will enjoy having it in your home. The Shandle is wrapped in this cute wrapping and has such a fun design. I chose this little dino, as we are potty training, but there are other options for you. Application is super easy. Remove from the package, remove the red adhesive protector and apply to the bottom of the toilet seat. It recommends you wait a bit before trying to use it though. Don't mess up all your hard work. Waiting is hard, but I know you can do it! Cooper likes to use the Shandle to lift the toilet seat while he is getting ready to use it. i think the added benefit of the cute dino helps with him wanting to go potty! He says "Hi Dino!" and "Bye Dino!" every time we are in the bathroom. Yes, my son is the cutest little boy ever! So, as you can imagine, I have added one of these to each toilet in my house and I am never going back. We are almost ready to consider ourselves somewhat potty trained and Cooper loves using The Shandle! Disclosure: A special thank you to The Shandle for giving Sweet Cheeks and Savings this opportunity to work with them. We received these items free of charge from The Shandle. No monetary compensation was received or offered, nor were we under any obligation to write about this product. All opinions expressed are honest thoughts. We were not offering any sales or taking orders for this item. We will not receive any compensation in connection with any sales of this item. I love the cute dinosaur very kid friendly. The Shandle looks fun and with my 4 and 5 year old we could definitely use it! This sounds awesome! I think my girls would like this in a girly version! That is cute and very unique. My three year old would probably like this. Thanks for sharing your review. Have a terrific weekend!